I've been under the weather lately so, I haven't made it out At the Fence. Today I wanted to tell you about a really neat little item for bonding with your baby. It is called a Snoedel. The Dutch word Snoedel means to snuggle. I received a cute blue one! It is so soft! Snoedels are designed to absorb the parents scent and then when you allow your child to hold or cuddle with the Snoedel it slowly releases the parents scent. Snoedels recommends the parent sleep with the Snoedel couple of nights before giving the Snoedel to your child. This will also need done again after washing.The Snoedel looks like a little handkerchief doll with a sleeping cap on., except it is made out of 100% flannel. Here are just a few of the names peope call their S noedel: Doll, Blanket, Lovey,Blankie, Woobie and Snoody. Visit this page, to see a few of the suggested uses of the Snoedel. Not only do they carry the Snoedels, but they also carry matching blankets! If you order the Snoedel/Blanket set, you will also receive a burp cloth. Snoedel is the original sleeping and bonding aid doll for babies completely handcrafted in the United States by moms, grandmothers, and female college students under "newborn-safe" conditions (environments free of tobacco and perfumes.) It is comprised of 100% natural fibers and has been safe for use with all babies including newborns, premature infants, and other babies in Neonatal Intensive Care units. Snoedels bring comfort as "aromatherapy of the very best kind - Mamatherapy (the scent of mom)". They are designed specifically to absorb and retain a mother's (or father's) scent. Then when held or placed near a newborn or infant the scent is slowly released to comfort the baby, thus improving sleep, aiding in bonding, and soothing a baby's crying or distress. A parent should sleep with the soft Snoedel for a couple of nights prior to giving the Snoedel to the baby. "We are proud to say that beginning with Arnold Palmer Hospital, has been used for over ten years to comfort hospitalized babies on ventilators, heart monitors and other medical equipment. These infants in NICunits, physically separated from their parents, gain comfort from their parent’s scent captured in the 100% natural Snoedel doll fibers. labor-intensive healing therapy in a NICU. The Snoedel is in conformity with the provisons of the Safety of Toys Directive (CE Mark) and can be sterilized for a hospital environment." Now Snoedels has a new Snoedel designed for your pet. You know, if your pet suffers from separation anxiety, or needs to stay in a kennel for a period of time. It is also great for breeders to send home with a new puppy to help prevent separation anxiety from mom. They are made from 100% cotton. Mandatory Entry: Go to Snoedels and tell me in a comment, which Snoedel you like best. You do not have to be a blogger to enter, but you must leave a valid email where you can be reached should you win. This giveaway will end 9/14 at 11:59 pm CST. The winner will be chosen using random.org and will be notified by email. The winner will have 48 hours to respond. Disclaimer: I received no monetary compensation for this post. I did receive a Snoedel for review purposes. All quotes are from the Snoedel website or email. All thoughts and opinions are mine. I would like to share another company with you. It is Taututina, (Happy painted gifts for a happy lifestyle.). Tatutina carries many different kinds of painted wood products, but I was able to review a set of bookends. They are adorable! We received the Yellow Dog Bookends. ($32.00) My daughters love them. They are sturdy and durable. They should last for years. This set would be appropriate for either boys or girls. The dogs are yellow with a bone in their mouth. The bookend frame is blue and on the front they say "Woof" with 2 little paw prints. Since I received my bookends Taututina has come out with several other new bookends, so you are sure to find one that matches the decor of your child's bedroom. The Baby Teddy Bear Bookends come in either blue or pink. Perhaps you would be interested in their Crayon Caddy on their Art page! They have some really cute recipe boxes ($25) too. I know that my daughter who loves to cook would enjoy one of these. Or perhaps you are interested in a place to keep all your takeout menus (The one pictured below is $28 but they vary in price). Then you might like their Takeout Menu Boxes. Another item they carry is 7 in. letters ($6 each), so you can put your child's name on the wall. You have several choices in design. "Tatutina, Inc. started in 1979, in the basement of our home in Massachusetts. Barbara Ottmar, Founder and artist starting hand painting her designs on children's t-shirts, sweatshirts and other garment items. After several years, we opened a small retail store that featured our signature hand painted shirts as well as children's wooden products, greeting cards, original art, and anything we could get our hands on and paint with our fun designs and colors! We also started wholesaling our products to stores in New England and then across the US. Tatutina is now a mother-daughter company: Barbara along with 2 of her daughters: Georgia Florena, artist/product development and Roberta O'Neill, manager of the business. Together, along with their dedicated team of customer service, quality suppliers and vendors, this little company that started in a garage has grown to small business that produces a full line of products for children and adults." So take a trip over to Taututina's website and see if they might have something that catches your eye! Disclaimer:I received no monetary compensation for this review. I did receive a Set of Bookends for review purposes only. All quotes are taken from the Taututina Website. All thoughts and opinions are mine. This little item I have to share is just too cute! Abbe Designs is a website where you can find some of the most adorable hairbands, totes, dresses, backpacks etc. and they are all monogrammed or embroidered. There are many designs to choose from for each item. I love the Lunch Tote that we were sent and I am having a hard time hiding it until my daughters birthday! So she won't be in the pictures with this one! The lunch tote ($16.95) that we received is a hot pink with her name embroidered on the front pocket in dark purple, with a gold, purple and pink crown right above her name. It also has a purple bow with white dots tied around the base of one of the handles. The Lunch Tote is insulated. I know my daughter will love hers when she finally gets to see it. They also carry matching items, like backpacks. Abbe Designs has many beautiful items to browse through, and they are not all girl! They have many designs for boys in their backpacks, pillows, lunch totes, drinkware, towels, etc. I am amazed at everything they carry. I love that each item can be personalized with a name or initials. Some of the hairbows can have a name or initials on them. 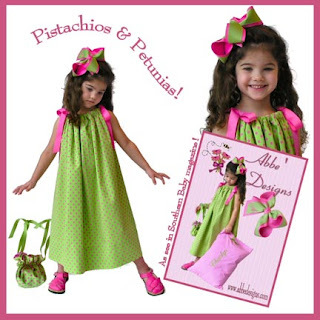 And the pillowcase dresses... any little girl would be overjoyed to receive one of them. For the adults they have laundry bags, glass cases, Check Book Cases, Cell Phone Holders and many more. Visit their site and scroll through the left side bar. Abbe Designs is giving the winner of this giveaway their choice of Lunch Tote (from the lunch tote page only. This does not include any other totes or backpacks). You may choose from the designs available there. (No customized designs) You will be able to have them monogrammed. Mandatory Entry:Visit the Abbe Designs Lunch Tote page and in your comment tell me which tote you would choose and how you would have it designed (colors etc.) You do not have to include your child's name or initials here. You do not have to be a blogger to enter but you must leave a valid email where you can be reached should you win. This giveaway will end 9/14 at 11:59 pm CST. The winner will be chosen using random.org and will be notified by email. The winner will have 48 hours to respond. Disclaimer: I received no monetary compensation for this post. I did receive a Personalized Lunch Tote for review purposes. All quotes are from the Abbe Designs website or email. All thoughts and opinions are mine. Winners and I need some feedback. Please help. Now I have a few questions and would appreciate if you could give me some feedback. At the Fence has been up for almost a year now and I wanted to see if you feel there are some improvements needed. Too many giveaways? Not enough information? Another way to list the giveaways? Other modes of entry? A different format? More advertising? Add other blogger buttons? Give me your opinion by leaving a comment. I would love some feedback. I had the opportunity recently to sample Zoodles. It is a browser that can insure extra safety for your children while they are on the internet. The basic Zoodles is free and your children can explore to their hearts content. They also send you a weekly email telling you what games, videos, activities etc. that your child has participated in. Each report informs you of the amount of time spent on each activity. "Through our Premium Membership, we give parents smart tools to guide their child’s online experience. Parents can further customize Zoodles by shaping the content and subjects, setting play time limits, selecting the right violence level, and more, all through an easy Parent Dashboard. We keep parents up‐to‐date on their child’s activities through frequent email progress reports. best children’s products and parent resources as well as a 2010 Parents' Choice Award from the Parents’ Choice Foundation." All of the content in the Zoodles browser has been rigorously screened and evaluated by our team of educational experts. This team includes teachers, children’s media developers, anti‐bullying advocates, child psychologists, and learning technology designers. Every Zoodles game has been played through in its entirety and assessed for its educational value, its alignment with national and state standards, its entertainment value, and its age‐ and skilllevel appropriateness. Any time your child attempts to navigate somewhere outside of a Zoodles‐approved link, they are blocked fromgoing there and taken back to the page they were last on. Additionally, Zoodles has developed a powerful Premium feature that allows parents to block ads from displaying on third‐party sites that their children visit. These ads often target children with inappropriate offers for car insurance, Hugh Heffner video games, or home loans." I am including quite a bit of information from their site, so I don't quote anything wrong. I do have to say I am impressed with all the available control the parent has over the site through the parental dashboard. If you don't care for certain games, or characters, you are able to block them. If you have a certain site you want added, you can. "For parents who dislike certain branded characters, it’s easy to remove them from Zoodles. Simply click Education and Parental Controls and then Block Shows. Then just type or check off the characters who you’d like to block. The same goes for sites and even for specific games." Controls and then Violence Limits to choose a rating level that you’re comfortable with." 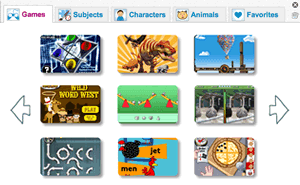 "The Zoodles browser is 100% free for families to download and play. All the parental features and controls are part of our Premium Membership, which costs $7.95 per month, $39.95 for six months, and $59.95 for a year. All new users will be given a 14‐day free trial of Premium Membership." reminders with how much time they have left. Once time runs out, a big blue clock appears and they are taken safely back to the starting log‐in screen." My daughter has truly enjoyed her time on Zoodles and I can enjoy knowing that she is not going to have something inappropriate pop up. Now, I still have safety rules in my home. No one is allowed to be on the internet unless they are sitting where anyone in the family can see what they are doing. No one is allowed on a computer in their room alone. I still want to be able to see and hear what is going on, but I did enjoy that extra safety. Here is a sample of the 8 year old Math Games. M troly likes to read also, so Zoodles has Reading Games available. Imagine my amazement when I saw her performing brain surgery on Edheads. She was even able to play some of our favorite Hasbro games. Edheads:"Edheads describes itself as a site that creates "unique, educational Web experiences designed to make hard-to-teach concepts understandable." Their vibrant, interactive games map strongly to national and state standards, and they encourage students to think differently about learning and problem-solving." Zoodles is going to give 3 winners 3 months of the premium service. I really suggest everyone at least try their 14 day free trial. Mandatory Entry:Visit the Zoodles website and let me know one reason why you would like to win this giveaway. (Time Limits, No ads, etc) You do not have to be a blogger to enter this giveaway, but you must leave a valid email where you can be reached should you win. This giveaway will end 9/13 at 11:59 pm CST. The winner will be chosen using random.org and will be notified by email. The winner will have 48 hours to respond. Disclaimer: I received no monetary compensation for this post. I did receive a 6 month trial for review purposes. All quotes are from the Zoodle website or email. All thoughts and opinions are mine. A quick update to list the most recent winners At the Fence! Make sure you enter some of the newest giveaways, like TeaGschwendner Teas, Hasbro Card Games, Socks n' Boots Share, etc. And then make sure you entered some of the giveaways ending soon like: Cutie Clothes $25 GC ending tonight, Level 8 Apple case of your choice 8/26, Crane Humidifier 8/27 and Kitty Wood Designs Necklace 8/30. A big thank you to all who visit At the Fence regularly. I just recently learned about a company called Fracture. They make one piece photos so you have no need of a frame! These are very interesting and I think many of you would like to learn more about this company. If I am one of the first 100 in this opportunity, I will be posting pictures of what my product looks like and I will tell you how I like it. It seems like a pretty neat idea though. I wrote this blog post in response to a TwitterMoms RAMBO alert, making me eligible to get a Fracture picture frame for review. You can learn more about Fracture at http://www.fractureme.com. Once again I get to share a tea company! TeaGgschwendner sent me two different samples of Cherry Tea! Just opening the bags and smelling them was a treat. I received the No. 992 Black Tea Aroma Edition Wild Cherry and the No. 1495 Fruit Tea Flavored Wild Cherry. I received 100g of loose leaf tea in both flavors. The cost-$9.35 per bag and $7.81 for the Fruit tea. I also received a book on teas, and a measuring spoon. I really enjoyed both teas. They each have a unique flavor. The cherry flavor is not as strong in the black tea, and my husband even liked it and he is not a big tea drinker. The fruit tea definitely has the stronger cherry, fruity flavor. My daughters and I liked. both of them. These would make a great addition to your tea cupboard, or as a gift for a friend. And if you prefer something other than Wild Cherry, I am sure you can find a flavor you like at TeaGschwendner. "Our passion for tea began in the late seventies when we opened our first small tea shop in Trier, Germany. From those humble beginnings, our company blossomed into what it is today, a global leader in specialty teas. Today TeaGschwendner has more than 130 shops in seven countries on four continents. We’re sharing the world’s finest teas with customers in locations such as Frankfurt, Germany; Vienna, Austria; Sao Paulo, Brazil; Riyadh, Saudi Arabia; and Chicago Illinois. Our tea shops are staffed with tea enthusiasts dedicated to exploring the world of loose leaf tea with our customers. Each shop carries a selection of more than 300 varieties including Black, Green, Oolong, White, Rooibush, Herbal and Fruit, and ranging in price from just a few cents per cup all the way up the rarest teas grown exclusively for TeaGschwendner by some of the world’s finest estates." TeaGschwendner carries so many different types and flavors of tea. They have Black teas, White teas, Green Teas, Oolong teas, and Fruit teas just to name a few. Along with the teas, they have accessories, such as teapots, sugar bowls, tea cups, storage tins, etc. You could spend a long time just browsing through all they have available. According to their website there are only three company owned stores in the US. One on Fifth Avenue NY, NY, one on State St. Chicago, IL and the last on Randall Rd. Algonquin, IL. There are two partner stores, one in Raleigh NC the other is in Ann Arbor MI. They have many stores overseas. You can like TeaGschwendner on their Facebook page or follow TeaGschwendner on Twitter. Thos will keep you updated on what they are up to, like new store openings, contests, etc. 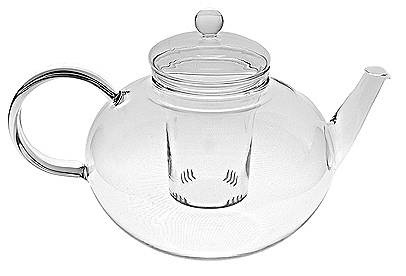 TeaGschwendner is going to give 3 winners a $50 Gift Certificate each and one Grand Prize winner will receive the beautiful Teapot pictured below. That makes 4 winners in this giveaway. Make sure you enter as many ways as possible. With fall approaching this would be great to win for yourself or as a gift for someone. Mandatory Entry:Visit the TeaGschwendner website and in a comment tell me a couple of their teas that you would like to try. You do not have to be a blogger to enter, but you must leave a valid email where you can be reached, should you win. This giveaway will end 9/13 at 11:59 pm CST. The winner will be chosen using random.org and will be notified by email. The winner will have 48 hours to respond. Disclaimer: I received no monetary compensation for this post. I did received 2 teas for review purposes. All quotes are from the TeaGschwendner website or email. All thoughts and opinions are mine. My K-Nex giveaway ends tonight (See the sidebar to enter), but here is another reason to enter. K-Nex has a search going on for the a K-Nex expert. Check out the details below. In addition to $10,000 for college, the three grand prize winners will also receive a trip for three to K'NEX headquarters near Philadelphia , PA for the K’NEXpert Award Ceremony, where they can meet each other and discover, through company designers and a factory tour, how K’NEX is made. Seven finalists will each receive $1,000 savings bonds and all ten winners will receive $250 worth of free K’NEX Building Sets, and their very own photo gallery page at www.knex.com. I received 3 card games from Hasbro and wanted to share them with you At the Fence. We received Mille Bornes, Sorry! Revenge, and Yahtzee Hands Down. We try to play games at least one night a week, but lately we have had a lot more time to play games. So, when these new games arrived we had to try them out. My children have all played Mille Bornes before, so it was a great favorite. Then we tried Yahtzee Hands down. A little complicated at first until we all understood all the rules, so we played through the first time with everyone showing their cards. After that, the game really took off. But, I have to say the game that became our favorite was Sorry! Revenge. The children want to play it during lunch, when they have a break, and it has quickly become an evening favorite. The only problem with the game? There are 8 of us and only four players at a time in the game. Sometimes we play teams, or we take turns and rotate out. Either way the playing often becomes quite hilarious as everyone teams up to beat dad, or the girls gang up on the boys. These are definitely some fun games to have in the house and you can pick them up for only $6.99 each. My whole family says thumbs up to Hasbro's newest card games. I do have to say that Hasbro is the maker of some of our other favorite games. My one son loves Monopoly. So much so, that for awhile everyone refused to play with him. He was hard to beat! Then of course Clue and Scrabble are made by Hasbro and those would probably be right in line behind Monopoly. We actually use Scrabble occasionally for homeschooling. It is a fun way to gauge your children's spelling and where they might need some improvement. Every family should have a game night! You can have snacks, play games and just have some fun together. It is a relaxing time for our family. We even played by candlelight, a few nights ago when our power went out. The children really thought that was great! Hasbro is going to send one winner all three card games. Mille Bornes, Sorry! Revenge and Yahtzee Hands Down. Mandatory Entry:Visit the Hasbro Game website and tell me one other game you find interesting. You do not have to be a blogger to enter, but you must leave a valid email where you can be reached should you win. This giveaway will end 9/9 at 11:59 pm CST. The winner will be chosen using random.org and will be notified by email. The winner will have 48 hours to respond. Disclaimer: I received no monetary compensation for this post. I did received Mille Bornes, Sorry! Revenge and Yahtzee Hands Down for review purposes. All quotes are from the Hasbro website or email. All thoughts and opinions are mine. Sock n' Boots Review and Giveaway! I thought this would be a great day out here At the Fence to share the book Sock n' Boots Share by D. K. Smith and illustrated by Lorena Isabel. I have to be honest, I am so leery of new books. If you haven't noticed yet, I am not into being hip and cool. I really prefer basic and innocent for children. I was really impressed with Sock n' Boots. Many times to teach lessons the main character does something wrong, gets in trouble and then learns their lesson. How refreshing to have two cute, little characters, Sock a gym sock and Boots a combat boot, who are pleasantly learning a lesson together. 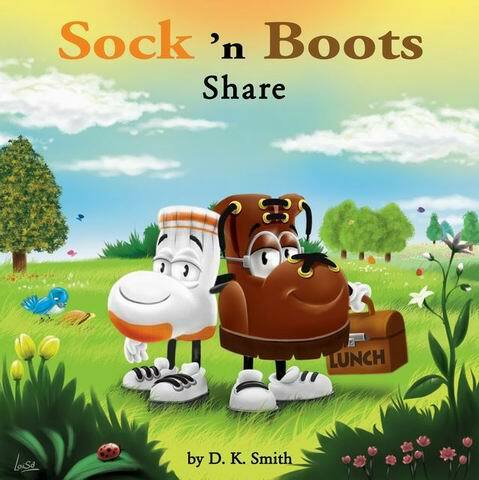 Sock n' Boots teaches a lesson on sharing without being too cool or too preachy. They just teach by example and show the benefits of sharing. For the remainder of the month of August we will be hosting a 5 book giveaway. Tomorrow we will be posting a digital version of "Sock n Boots-Share" at www.socknboots.com. In order to enter, a person just needs to read the digital version of the book and post a review on Amazon.com. The 5 most interesting reviews will win an actual copy of the book. Sock n' Boots is definitely worth sharing At the Fence, and anyone who has a chance should stop by and read the book and enter the contest. But, don;t forget to enter here as you can also receive a copy here. Sock n' Boots is designed for you to share time with your child/children. It starts out with a question and when you are through it asks the question again to open discussion between you and your child about sharing. The pictures are cute and colorful and there are more books coming in the series, so keep your eyes posted. One winner will be sent their own copy of Sock n' Boots Share. Mandatory Entry:Visit the Sock n' Boots website and then in a comment let me know which character you find the cutest. You do not have to be a blogger to enter, but you must leave a valid email where you can be reached should you win. This giveaway will end 8/31 at 11:59 pm CST. The winner will be chosen using random.org and will be notified by email. The winner will have 48 hours to respond. Disclaimer: I received no monetary compensation for this post. I did received a copy of Sock n' Boots Share for review purposes. All quotes are from the Sock n' Boots website or email. All thoughts and opinions are mine. Flings is allowing me to do, one more giveaway of their Fling Bins. This time we are discussing a Party on the Go. First priority for a party on-the-go is the cooler. Keep food fresh and guests refreshed while saving space. Pour out half the contents of individual size plastic water bottles and freeze them overnight. When packing up the cooler add filtered water to the bottles and replace the cap. These bottles will do double-duty by keeping food cold eliminating the need for ice, as well as serving as cold drinks for guests. · With the food, it’s all about simplicity – think about what’s easy to prepare over a grill or campfire. Mix up a favorite burger blend at home and form patties. Place wax paper between each patty and stack them in a coffee can. They’ll be ready to slap on the grill as soon as it’s fired up! · Another fun and efficient option for on-the-go eating is “Swiss Army Food.” Loaded baked potatoes are a great example – stuff them at home with cheese, green onions and bacon bits so they are ready to bake over a campfire or on the grill. · When guests arrive offer them a welcome kit complete with essentials so they are just as comfortable as they would be at your home. Simply wrap plates, utensils, napkins and condiment packets in a colorful fabric square or napkin. Travel smart and think ahead by having trash and recycling bins available. Flings Bins are packaged flat so they are convenient to take on-the-go and serve as the perfect alternative when trash and recycling options are not available. They are extremely strong and leak-proof with a built-in drawstring, allowing for easy transport from the party site to the park trash can. Simply pop open the bin and fill with trash in one and recyclables in another. Several designs are available. For more information, visit www.FlingsBins.com and www.Facebook.com/FlingsBins." Flings are really handy for a Party on the Go. They travel almost flat. When you need them you just pop them out, fill them up and dispose of them when you are done. They are so convenient! Flings is giving away 2 bins to one winner. The winner will receive one recycling bin and one BBQ bin. Mandatory Entry:Leave a comment telling me about an event you have coming up. You do not have to be a Blogger to enter, but you do need to leave a valid email where you can be reached should you win. This giveaway will end 9/8 at 11:59 pm CST. The winner will be chosen using random.org and will be notified by email. The winner will have 48 hours to respond. Disclaimer: I received no monetary compensation for this post. I did not receive anything for review purposes. All quotes are from the Flings Bins website. All thoughts and opinions are mine. This is a really neat company that does custom made Blankets and Loveys. 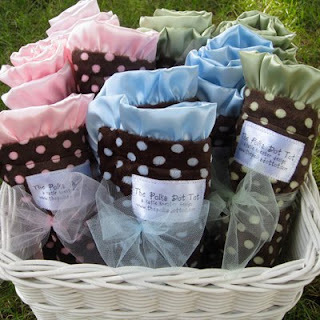 It is called Posh Blankets by The Polka Dot Tot. Now since this is not a review, I am going to have to take a lot of information from their site, but I think you will really like them. "It all started with a burp cloth. Then we designed blankets,… then bibs… then towels… then hats… then pillows… then T-shirts… then blankets for adults… and children…and teens… and thus, we became The Polka Dot Tot. It was so much fun to design that we didn’t know where to stop! We loved being a one-stop-shop for baby items but what our customers really loved were our blankets. We heard time and time again stories of children who couldn’t sleep without their lovey or a child who could only be soothed by their blankee. We took our blankets to some gift expos and people oohed and aahed as they felt our fabrics. The most common comments we got were that our blankets were the softest and most beautiful blankets they had ever seen. The most snuggly… the most luxurious… and… can you make that baby blanket in an adult size?…and thus, we became Posh Blankets. We have so many customers who contact us and request custom fabric combinations for their blankets. There are endless possibilities so we decided to let you, the customer, become the designer. Only you know what you like and what would look best in your home or exactly what that perfect gift would be. Whether you are designing your own blanket today or shopping from one of our designs, our hope is that you find exactly what you have been looking for. We love to hear stories about the babies, children, and adults whose lives have been just a little bit better because of one of our Posh Blankets, so keep them coming. We hope to brighten your day too! " 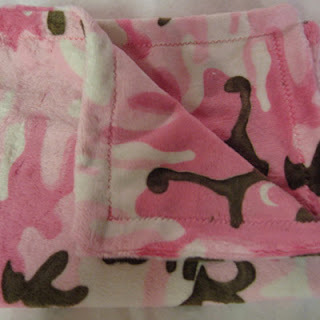 Posh Blankets also makes different size blankets, Gift sets, T-shirts, Pillows, Diaper Covers and Fancy Pants. They do have a Gift Registry and Gift Certificates. 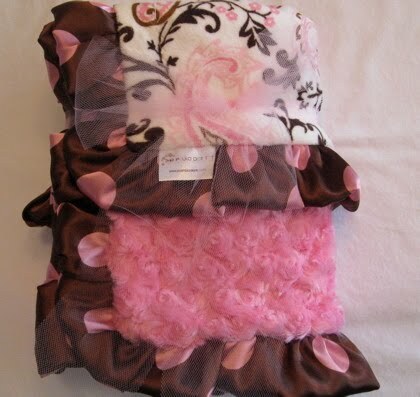 Posh Blankets is going to let one person win a custom Designed Lovey. The Lovey is 14 x 17 and is designed to be a comfort blanket. You can see some customer comments here. 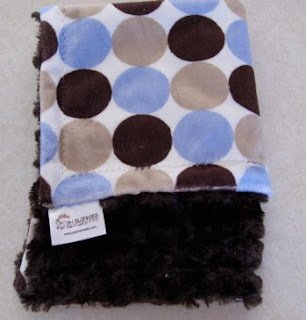 This would make a great gift for an expectant mom or for a newborn. Mandatory Entry:Go to Posh Blankets and design a custom lovey and then post your link here for the lovey you designed. You do not have to be a blogger to enter, but you must leave a valid email where you can be reached should you win. This giveaway will end 9/7 at 11:59 pm CST. The winner will be chosen using random.org and will be notified by email. The winner will have 48 hours to respond. Disclaimer: I received no monetary compensation for this post. I did not receive anything for review purposes. All quotes are from the Posh Blanket website. All thoughts and opinions are mine. Boiron USA Calendula Cream Review and Giveaway! Kitty Wood Designs Review and Giveaway! Winnie the Pooh, Eeyore and Tigger Giveaway!